I have a UITableView and I have only 3 rows in it, and I can see those 3 rows. The problem is the cells that are empty: I can see lines there. I don't want to see those lines. Any idea how to remove those lines? Below is image for what I am looking for. 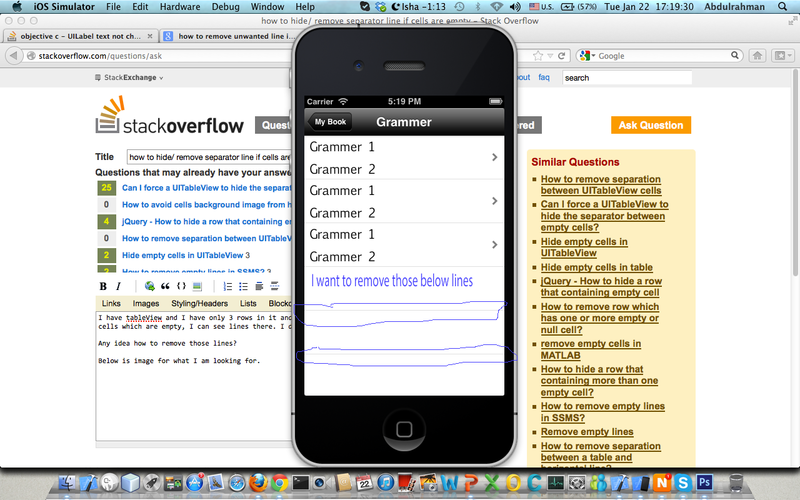 separatorLineView.backgroundColor = [UIColor clearColor]; // set color as you want. Not sure but it's working in all the version of iOS that I checked, with iOS 5 and later, up to iOS 7. Transparent UIView as a tableView footer with 1px height will do the trick. Updated answer for swift & iOS 9. This works for tableviews of the .Plain variety. Use this Code for remove separator line for empty cells. You can set the table view to be grouped instead of plain - this changes the look a bit but at least removes the extra lines. I had this exact problem and ended up changing to grouped views. Looks a lot better. even time a cell is "reused", you will add a new subview for the divider! a) use a TAG, and: 1) ask for a subview for that tag let divider = cell.viewWithTag(TAG) ... 2) if present, do NOT add another subview 3) if NOT present add AND tag it. b) create a custom view and ADD your custom divider in "init" "awakeFromNib" of custom cell. Add the following line in UITableViewDataSource numberOfRowsInSection: method. How to set dynamic cell separation line in UITableView? IOS Dev - How to make those empty table cells invisible? How to set UITableViewCellSeparatorStyleNone in tableview?